"It's where the President gives an account of the work that has been done, but at the same time where he details the way forward. "It is where he details that in the current financial year these are the activities that we will be embarking on and giving a clear direction to the country and the world, especially for those that want to come and invest in the country," said Ndabeni-Abrahams. Tonight's occasion is expected to focus the nation's attention on the symbolism and ceremonial content of South Africa's democracy, as well as on the substance of renewal and growth at a time when South Africans wish to see and experience inclusive and sustainable growth that creates jobs and sustains communities. 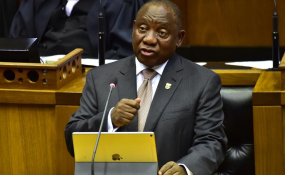 "It's very important for people to participate in the SONA, because as the ANC government we have always preached the message that we can't do it all, we have always believed that this is the government of the people by the people," said the Minister. "My favourite moment is when the President is entering and the citizens are there giving their respect and showing their hope and faith in the leader of their country, that's one moment when I am like 'wow South Africa, indeed this is an opportunity'," said the Minister.